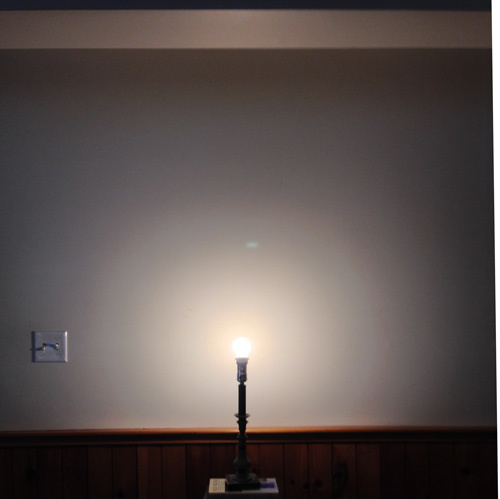 Herewith photos of the light from a Home Depot Cree LED light bulb and an equivalent Walmart bulb manufactured by TCP. The lack of differentiation may surprise you. The Walmart spokesman I talked to offered to send me an 800-lm sample. I accepted. It arrived... Hard to distinguish from the Cree in lumen level, light distribution, or color temperature. In other words, customers are not going to be turned off by their first impression of the TCP product. 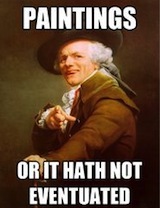 To this our resident diabolical advocate Ron Amok replied with this version of the Internet meme "Pics or it didn't happen." This quick blog is my answer to Mr. Amok. Using my iPhone 5, I took high-dynamic-range (HDR) photos of the light from a Cree LED bulb from Home Depot (800 lumens, 2700 CCT, 80 CRI) and the TCP bulb that Walmart sent me (800 lumens, 2700 CCT, believed 82 CRI). 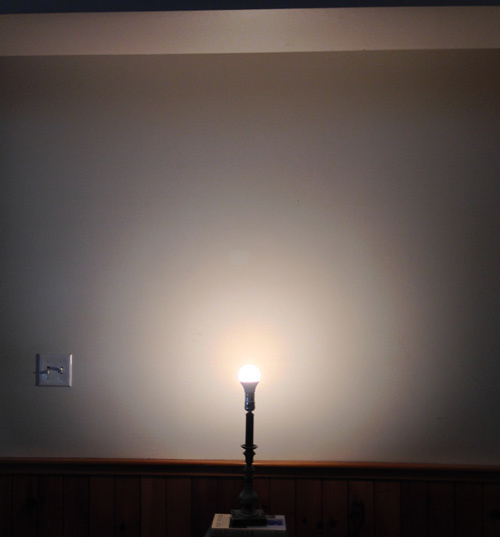 For comparison I added a similar photo of a 60-Watt unfrosted incandescent bulb. You'll find them after the "Next" jump at the end of the blog. Left: Cree and right: Walmart (TCP) LED light bulbs. 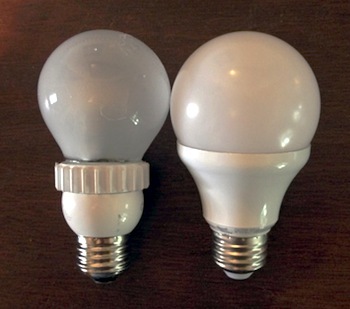 Here are the Cree bulb (left) and the Walmart Great Value bulb, manufactured by TCP (right). The Cree is about half an inch taller to accommodate its heat sink and driver electronics, while the TCP's bulb and heat sink are broader. The Cree's shell is coated with a rubbery layer that somehow makes it feel more substantial. Both shells appear to be plastic. Community member Ed Rodriguez opined that comparing such products can be a waste of time, because they are all made in the same factories in China, possibly on separate floors of those same factories. I have to say that, at the cursory level of this comparison, and without tearing down both bulbs for a closer look, Mr. Rodriguez appears to be on the right track. Comparison photos are below. For completeness I have included, at the end, photos taken without the iPhone's HDR option asserted. It's plain that using HDR reveals more nuance for a comparison such as this. High-dynamic-range photo of light from an 800-lm Cree LED bulb, bought at Home Depot. The next photo shows the light distribution from the TCP bulb. The light appears very similar, though the TCP bulb may be just a bit warmer. 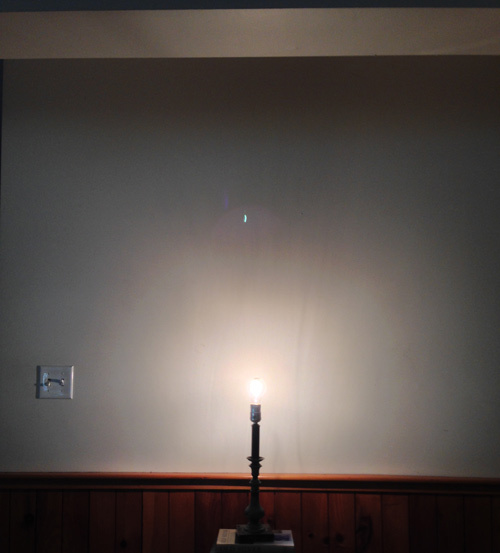 High-dynamic-range photo of light from an 800-lm TCP LED bulb, sent to the author by a Walmart spokesman. Here is a similar photo of a 60-Watt incandescent bulb, which is marked 800 lumens. The bulb is unfrosted. High-dynamic-range photo of light from a 60-Watt incandescent unfrosted light bulb. 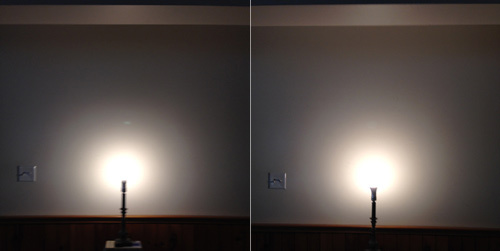 Normal (non-HDR) photos of light from Cree (left) and TCP (right) LED light bulbs.